Unfortunately, we have cancelled the launch window for today. Although the weather was suitable for launch in the early afternoon, the weather balloon data obtained in the evening showed winds at lower altitudes are much stronger than predicted. This led to margins on wind becoming smaller than expected, making a launch today not possible. As we abort the launch relatively early in the evening (T-2:50 hours), the crew still has sufficient time for a good sleep. 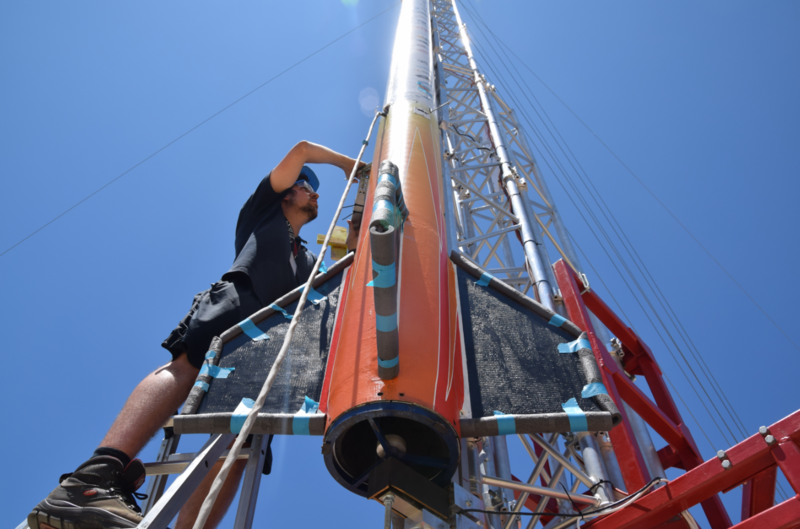 This way we can ensure Stratos III is fully ready for the new attempt scheduled tomorrow, the 25th of July. Thanks a lot for all the enthusiastic and inspiring comments on social media. Let’s all take a good night sleep and prepare for breaking boundaries tomorrow! Propulsion engineer working on the Stratos III rocket. Good luck for todays attempt! Hey Sam! Thank you so much! Let’s hope winds are more favorable today! Thank you very much! We are fully ready to break boundaries today! A vossa equipa está a causar sensação em terras Lusitanas. Good luck today, guys. Hopefully weather will be ok this time! Is it possible to publish a short list of abbreviations used during radio contact? During the launch of StratosII+ I learned that VIO stands for Vehicle Interface Officer (or something like that). Yesterday during the livestream I heard “TC”, and I was not able to understand which role was speaking. Good luck for the team with your second attempt tonight! What hapened on 25th?? We are expecting!! Read the bad news this morning on http://www.bright.nl. What a disaster. So much time spent imploded in a few seconds. Wish you lots of strenght with this loss. You are real winners, do not forget that! You put a lot of knowledge and skills in the project and you gambled and lost and the end. It is a pity, it made me remember the accident with the space shuttly. Happily there are no people injured with your project, may be your pride. I am still proud of you all. Do not forget that. Feels bad for you, and also for the personel of the INTA´s having to work until late too. Hope the next lauch is succesfull so you can celebrate it properly!